Winchester HiFi are specialists in high quality audio music systems and hi fi equipment. They sell a wide range of products from around the world including turntables, compact disk players, digital streamers, amplifiers, speakers, isoblue hifi furniture and accessories. Winchester HiFi also now sell Loewe Art & Loewe Connect 4K UHD televisions making them a top quality Audio Visual dealer in Winchester. Winchester HiFi's finest speakers include Focal loud speakers, Neat hi-fi speakers, Wilson Benesch high performance speakers & REL subwoofers which can all be viewed at the Winchester city centre store. Winchester HiFi offer a system matching service for customers who already have music systems in place and also have a service department which can offer repair estimates for your audio equipment. 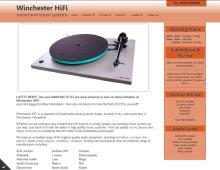 Winchester HiFi are specialists in the Hi fi business, ideally located in Winchester, Hampshire. They serve the local areas of Bournemouth, Southampton, Portsmouth, Salisbury, Basingstoke, Farnham, Chichester, Peterfield, Stockbridge and Newbury.